All of us are living a story. Together we are living in the middle of God's story - for us, and for our neighbor. 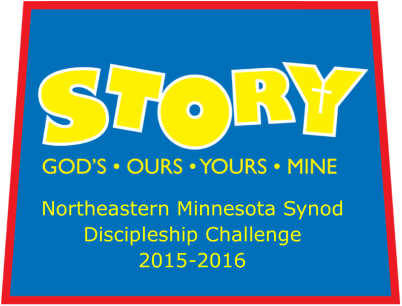 This year the NE MN Synod Discipleship Challenge will live out our faith practices through the sharing of stories. Stories challenge and inspire us on our faith journey to live out the faith practices of give, invite, serve, study, worship, pray and encourage…and many more. As we share our stories of life and faith, we come to KNOW God’s Story for our lives and the world…to BE God’s Story of love and reconciliation in the world…and to TELL God’s Story so the world can know all are included in God’s Story! This year, let’s take time to share our stories, to hear the stories of others – to live out our faith practices as we grow in God’s story for all of us! Teach the STORY acronym tool. Intentionally incorporate opportunities to share stories of life and faith into what you are already doing. Use the suggested Story Starters or your own questions. Optional: Go deeper with the "Story" Study Guides. We get to know each other through stories, and the deeper we know each other, the better we can accompany each other on our faith journeys and in our ministries. God is at work in and through all our stories! Just like Facebook prompts members to share what’s on their mind, ask questions relating to what is happening in someone’s life. What happened today/this week/this month? What is something that went well today? What is something that didn’t go well today? Get to know someone’s history, what is important to them, what they like to do. What is a nightly/daily ritual for your family? Despite what the news might show us on a daily basis, there is hope in this world because of our faith in Jesus. And God has given us gifts to share for the good of others. Ask questions that get at stories of calling, purpose and hope! Describe a time you have felt hope for the world/your church/your family. What makes you excited as you look at the coming month/year? Ask questions to learn about the people who have shaped our life stories. What relationships do you most value right now? While this phrase has a cultural definition of someone going on and on about the obvious things people should know, the Hebrew definition is “to know” and translates into several deeper meanings of knowing. So often we think we know each other (yada, yada, yada) – but do we really, deeply know the people we encounter each week in church, in our communities, in our lives? Ask playful, random, obscure, trivial, deep, silly, wondering questions to get to know someone. What super-hero power would you like to have? Below are Story Starters you might use each month. They are grouped by topics, and the questions grow a bit deeper each month. Use one question a week, or all questions in one sitting. Adapt questions to suit your group, or use as is! One question a week will be posted on our synod Facebook Group – share your stories, and get to know others in your synod! Use during council meetings, youth group, coffee hour, at the beginning of Bible studies, before choir practice, at the close of worship before heading to coffee hour, at meals...anywhere people gather and can share stories! Get to know your colleagues! The Story Starters below have been adapted for use at network meetings, staff meetings, text studies, Conference Meetings – any time you are gathered with colleagues in ministry. Want to dig deeper into stories? The 2015 Practice Discipleship curriculum, “Story”, has been adapted around the KNOW – BE – TELL framework of the Discipleship Challenge. Each session can be done as a Bible study in one sitting, or done section by section over the course of several weeks. These were adapted from the 2015 Practice Discipleship Curriculum. Download the full curriculum here. If you would like a member of the NE MN Synod Practice Discipleship team to come to your congregation to lead a session, please contact Catherine Anderson at 218/724.4424. Discussion Guides and Videos from previous years are on the "Faith Practice Videos and Discussion Guides" page.